Unique Moments Photography is always there while you are getting ready. If you are getting ready at a church or a room with blinds, then you can expect to see your photographer preparing the area for images that are always compelling and beautiful. Sweet Sweet window lighting for a bridal portrait. It cant be beat. Always beautiful. So If you see your photographer clearing an area next to a window, closing all the drapes on blinds so only a tiny little bit of natural light in coming into your dressing room and video lights are behind you, don't worry because we are getting ready to create some magic. A Huge Thank you goes out to Cliff Mautner from Philadelphia for teaching us this technique 3 yrs ago at his 4 day workshops for Professional Photographers. 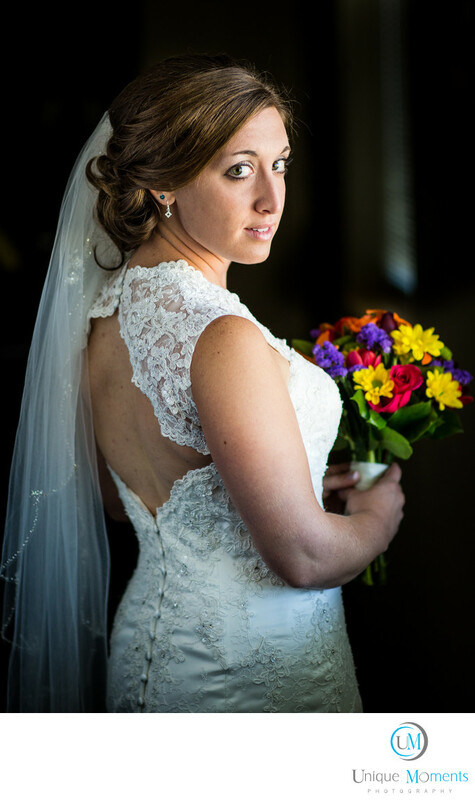 Our brides always love these images and we try to take window light shots at every wedding. She is all dressed, make up is in place, everything is perfect and the lighting should be perfect for these beautiful natural light images. Location: 3510 Rosedale St NW, Gig Harbor, WA 98335.